Danish Hi-Fi is always a bit out of the usual, one way or another; however, one thing is for sure - Danish Hi-Fi is always a serious attempt and should thus be granted proper attention. In brief, Thule Audio has been in business for some 9 years now, and is the child of Mr Anders Thule; if the name conjures pictures of Prince Valiant, who originated from Thule, you are forgiven (actually, I thought the same upon first hearing the name). It appears to be a very active company, with a product portfolio consisting of several levels and several models within each category. The tested products belong to their entry level range. The next range up uses fully balanced topology, and the highest range is extremely flexible, and may be used for stereo or multichannel home theater use. As for appearances, the photos tell their own story, so you can make up your own mind; I feel these are products with exquisite simplicity, with what is probably a timeless design. Yet, for all purposes, this simplicity is deceptive. Clean external lines give way to very sophisticated electronics inside and to an extremely well thought out and manufactured casing. The casing is made from pressed steel and is consequently very heavy; this is always a good sign, as heavy casing tends to vibrate less than light casing typically used in commercial products. Only the top plate is detachable, and is held down by five screws; if fastened properly, there will be no rattling even when the case is struck with the palm of a hand quite forcefully, testimony to precision mechanics not often seen in this price bracket. The front has been made from a solid aluminium plate, some 8-9 mm thick, which has been machined to produced a gentle sloping front panel, which looks and feels expensive, but in a very understated manner, not at all boisterous like most Far Eastern products. It's - well - very Danish, firm, solid, beautifully finished in deep black, exuding quality, but in a very polite and diplomatic manner. Its smooth surface is interrupted only by a window behind which resides a digital display in red (with three positions - normal, dim and off) and a volume knob, with a small push button selector in the right upper part of the display. Inside, the electronics are surprising in two ways. The first is extensive used of SMD (Surface Mount Technology), which allows for several distinct advantages - much reduced dimensions of circuit boards, thus also shortening the signal path and consequently avoiding possible signal degeneration through interference pickup or stray capacitance, all machine manufacture, it's very cost effective and extremely reliable, which is why it is used in computers. Actually, I saw only several large and larger value capacitors, which were subsequently added by hand soldering (unavoidable, I'm afraid). In the IA60, power is supplied by a 300VA toroidal transformer, appearing to be a quality part. It is commendably well fastened and you can throw the box in the air without worrying it might come off. Connections, and especially high power connections to and from the transformer, use heavy duty screw down connectors, good for both electricity and safety. Circuit boards are very cleanly designed, with obvious experience built into them, something I like to see. The actual electronics use selected parts. The preamp uses Burr-Brown OPA2134 integrated circuits with FET inputs - not my personal choice, but units which cannot be called either cheap, or nasty. The output stage uses a pair of 2SA1633/2SC4278 bipolar transistors, with one pair per channel in a SEPP (Single-Ended Push-Pull) configuration. Since these are 100W transistors, I think more powerful units would have been more appropriate (2SA1302/2SC3281 spring to mind - similar characteristics, but 150W rating). However, these transistors are firmly bolted to an SK85 heat sink (app. 0,64 deg. Cent./W), which is well specified, and do not use too much quiescent current when idling. Also, I cannot fault them for lack of power during hard long term use, so my quibbles are of a more personal nature. Thule Audio believes in the zero overall feedback approach. According to them, it's best to correct problems where they appear and resolve them locally to the point where overall feedback becomes redundant. In theory, this is indeed so, but in practice, things tend to get complicated; nevertheless, there's no doubt that this is a better approach than the one typically used in serial production audio, where relatively large amounts of feedback are used to correct problems occurring throughout the amplifier. Electrolytic capacitors, which I believe to be of critical value for the sound produced, are made by Nichicon, and with adequate rating of 10.000 uF; that's "adequate", not excellent. By way of comparison, my old but beloved Harman/Kardon 6550 has a rating of 50W per channel, but uses Elna For Audio (roughly similar in quality) capacitors each rated at 13.000 uF. The rectifiers are made using well selected discrete diodes rather than block bridge rectifiers, as current practice demands (though it has never been actually proved to be a better method). Also worth mentioning are the connectors. All line input and output RCA Cinch connectors are gold plated and soldered directly to the boards - that's good, as there are no wires to spoil the show. Better yet are the outputs - they're also directly soldered to the board, also gold plated, and will accept larger speaker cables. However, I did run into some problems trying to fit my Jamo 4,5mm cables into the holes provided - it seems they will go up to 4 mm. So, after some insults, cajoling and torture, the cable was inserted. The somewhat novel method here are the volume and balance controls. Despite what your eyes tell you, that the unit has only two controls, one for presumably switching on and off and the other for presumably volume adjustments, secondary controls are delegated to the remote control. There, you will find all you need to control this amp, plus Thule's CD players and their solitary tuner. Among other things, you will find a balance control, which like the volume control is calibrated in 1 dB steps. This has been made possible by implementing National Semiconductor's LM1792 digital volume control. In effect, this is a ladder network using 80 laser trimmed resistors per channel. Therefore, its precision is way beyond any standard potentiometer, including the most exalted ones from Alps and Noble. Also, as there are no mechanical contacts involved, there is no aging either, again something no classic potentiometer can match. Facing this amp was a pair of units which might be its competitors on any market. One was cheaper, in form of a Yamaha AX-592 integrated amplifier (2x100W/8 ohms, still untweaked), and the other dearer, in form of a now discontinued Harman/Kardon 6550 integrated amplifier (2x50W/8 ohms - current similar model is designated 650). The H/K has been my reference point for relatively mass produced products for some years now - it was fairly expensive at the time it was purchased, but was considerably cheaper than anything that might be called higher class, let alone High End. The Yamaha was purchased as a fair representative of truly mass produced items from the Far East (Japanese company, Made in Malaysia) - it is an honest amplifier, with a very good midrange, but some quality degradation on both extremes. In a poorly matched system the Yamaha will sound terrible, while the H/K will not sound as good as it can be, but with far less deterioration than Yamaha; in a well matched system, Yamaha will give a good account of itself, while the H/K will manage to shine here and there. Both however are exceptionally load tolerant - currents in excess of 20A are available from both, the Yamaha peaking at around 30A on short impulses (< 20 msec). Of the CD players used as sources, we have an old but modified Marantz CD53, whose standard NJR2114 op amps have been replaced with AD OP275 chips, and some decoupling capacitors have also been changed - the result is the classic sound of Marantz, but with extra life and vigour added (like when you take a pizza Margherita and add some mushrooms and ham). 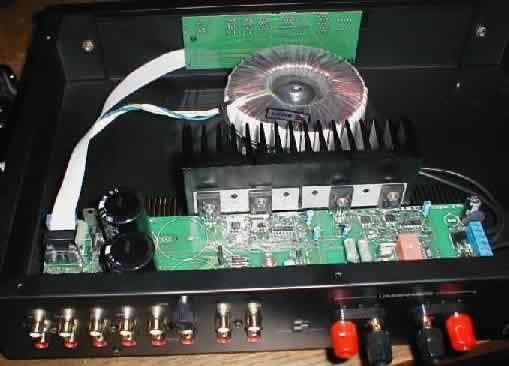 Then there's a modified Philips CD721 player, which instead of the standard 4560 op amp uses an ultra fast AD 826 op amp (350V/uS, fast even by Spectral standards) and a completely new, additional power supply. Finally, there's a Harman/Kardon CD730 player, its claim to fame being that it uses a discrete analog output stage in a dual differential configuration, consuming all of 38 transistors. In all cases, MIT Terminator 4 interconnects were used - while far from the best, I feel these cables cannot be beaten on a value for money basis, and of course, they are light years ahead of what is generally supplied with units in this price bracket. The first set of speakers uses a pair of JBL Control Monitor CM62 two way nearfield monitors, augmented by JBL's own Sub 10 active subwoofer (10" driver, 100W), its cutoff frequency adjusted to 125 Hz, in phase with the satellites, volume knob judiciously used. The second set of speakers, in a different room, was a pair of JBL Ti600 floorstanding boxes, and the third, the roaming set of speakers, was a pair or modified AR94 floorstanding speakers. Upon first turning the Thule IA60 on, I was immediately struck by what I would describe as a meaty bass. It was full, rounded, flowing, warm, but it seemed to me more powerful than it was supposed to be. I certainly never heard the relatively small CM62 give out such bass lines without the subwoofer. The Ti600 literally shook my window panes, as did the ARs. When this happens in a system, the first thing one needs to know is what's causing these effects, and indeed, whether one is experienceing an anomaly or simply a different sound. Now, I've heard audiophiles complement H/K on its bass and midbass drive, energy and vigour - it's simply full of life and totally uncaring for the speaker. With all my CD players as the source, these virtues were retained, but when IA60 was inserted, things changed - too much bass on both the JBL Ti600 and AR94. Now, God knows how I love good bass, but that's "good", not "too much". But I still doubted, so I borrowed a pair of Sonus-Faber Concertinos from a friend; these speakers are especially dear to me, and I believe them to be the best thing ever made in that price bracket. If anyting, they are very neutral, but far from shy - when they gave me plenty of bass, I knew that indeed there was more bass than usual. Against this, one needs to pit the rest of the spectrum. Now there, the news are all good - the midrange is very coherent, very natural and easily flowing. Much the same is true of the high range, but subjectively, it was more quiet than it should have been - or was that the prominent bass dominating the sound stage? Nevertheless, there is a distinct feeling of freedom, the music breathes life, it's free to do as it pleases, and IA60 tries - and commendably succeeds - in diplomatically leaving the room while the music is playing. It's that good. What will surely attract your attention, and what I think is IA60's greatest strength and virtue, is the three dimensional space it recreates. For the life of me, I cannot remember any unit in this price bracket which is so good at sounstage depth as this one. It's almost uncanny how the music begins to breathe, and how you stop listening to a performance and are simply thrown somewhere else, where the musicians live. It's a feeling you instantly fall in love with, something you won't get out of many a competitor. Still suspecting it of an exaggerated bass line, at first I omitted connecting the H/K CD730, which is a fair CD player known for its unusually clean and authoritive bass lines (albeit coupled to a somewhat dark tonal picture), and went on the the Marantz CD53 first. The soundstage I got was good by any measure, way above what typical Japanese products have to offer. OP275 can do wonders for Marantz players, as is well known and documented (just look over TNT's site), and this player agreed well with IA60, but, ... but with a somewhat pronounced bass line once again. When the modified Philips CD721 was pressed into service, it also produced an accented bass line. Right. Then I connected the preamp output of the IA60 with the power amp input of Yamaha. No pronounced bass lines were heard, but the Yamaha certainly sounded a lot better than when using its own preamp, much cleaner and more transparent. Then the reverse - Yamaha's preamp outputs were used to drive IA60's power amplifier. Back to square one - in overall quality, the sound was considerably below IA60 on its own, testimony to its preamp quality no doubt, but still with a strong bass line, now somewhat softened by Yamaha's preamp shortcomings. So that's that - Thule Audio IA60 has what I would describe as a slight loudness contour effect, which quite simply emphasizes bass lines. To be sure, it's a very pleasant sound, but it does tend to mask the mid and high ranges, making them appear subjectively softer and more quiet than they are supposed to be. Details tend to be masked (but not lost!) that way, and the glorious feeling of three dimensions is somewhat compromised. For example, the sound of metal brushes is all there, but it's simply more quiet than it should be, and it lacks the sting it usually has. And I checked and double checked that, I went to test myself and the CD to a friend who has Theta equipment. This is not to say that IA60 is bass heavy - it's not, it just seems to add a touch to the bass that isn't normally there. It's a slight effect, but it is clearly heard. You might find it's more of a tonal color than actual volume, but the subjective effect is the same - meaty, but clean. Changing to softer chamber music does improve things, but only by virtue of less bass present in the original material. Strings are very natural, with exactly the sound they should have in a live performance, much like really being there - a powerful achievement, no doubt. If you want to impress someone, just play "1812" for them. The cannon shot will make them either jump for cover, or get a heart attack, it's that powerful, clean and convincing. But be careful - it may cost you your speakers if you overdo it. So save that effect only for the tax collector. Play "Everybody Needs Somebody To Love" from "The Blues Brothers" and if you close your eyes, it will be easy to feel that you're there, not here. Still more impressive is Celtic music - I could listen to Connie Dover's "Ubi Caritas" or William Jackson's "Salve Splendor" for days on end, such is the vibrancy and texture of this product. I believe this unit falls short of its potentials precisely by what is quoted as its greatest virtue - lack of overall feedback. Its sound reminds me very strongly of Electrocompaniet, a Norwegian company with similar ideas, albeit executed in a different way and at a very different price. While truly free of grain and typical transistor nasties, IA60 suffers from more than necessary bass, a feeling I also had when listening to EC's smallest integrated amp at approximately three times the price. In my opinion, the old H/K 6550 which uses just 14 dB (5:1) of overall feedback, produces a better balanced soundstage with a better controlled bass - it's not as warm, meaty or rounded, but has more authority, vigour and a better definition. On the other hand, in terms of three dimensionality, IA60 clearly beats the H/K and of course the Yamaha. It is by no means a bad unit, it simply has a specific musical signature which you must hear to understand. If you have smaller loudspeakers, you might find the strong bass Heaven sent, but if you have speakers which go deep down on their own, you may find it a little too meaty. But remember, you will need to listen to it for some time to get the true feeling of it. Its plus sides are no doubt almost complete freedom from compression at normal levels and a very natural midrange, rare traits indeed in this price category.